East West Management is a second generation family-owned and operated business that provides a quality living experience for residents in neighbourhoods across the Greater Toronto Area. As a company and a family we pride ourselves on the fact that we care about our residents, our communities and our buildings. Our efforts have resulted in a successful business operation that has spanned over 40 years. If you want to live where you matter, contact the rental offices at any of our buildings. We know you won't be disappointed! Our management team has over 50 years of combined property management and construction experience. This experience sets us apart from other companies that seem to have a revolving door of staff. We invest in our communities instead of looking for band-aid solutions. We plan on owning these buildings for the long term and so every decision we make is with that key element in mind. It is our hope that these buildings will remain in our family for generations to come. It's our business; our life; our legacy. Our corporate philosophy is to provide a quality living experience at reasonable prices for the local community. We believe in acting professionally, responsibly, and efficiently at all times in order to provide a superior level of customer service that is beyond anything you might experience elsewhere. We welcome you to East West Management where you can experience the convenience of walkable locations! 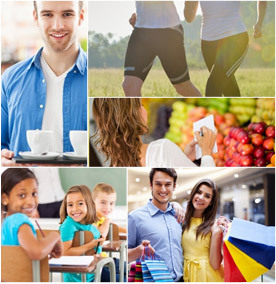 All amenities are just steps from our buildings!